Home » Television » DVD review: Bones – Season Two. DVD review: Bones – Season Two. I was glad to learn the quirky, standout characters of Bones would live to see a second season–one that indeed delved into their lives. To start, Dr. Brennan (Emily Deschanel) must adjust to a new boss, Dr. Camille Saroyan (Tamara Taylor), who has the people skills Brennan lacks as well as a previous relationship with Special Agent Seeley Booth (David Boreanaz.). Saroyan works more closely with Brennan and her team than did Dr. Goodman (the departed Jonathan Adams). Adding to Brennan’s worries is the sudden appearance of her fugitive father (played with heart and menace by Ryan O’Neal). Meanwhile, Brennan’s friends face challenges of their own. Midway through the season, Booth is suspended for firing his weapon without cause and forced into multiple sessions with an FBI psychiatrist (Stephen Fry). While Booth is away, Brennan is assisted (and romanced) by a new FBI contact (Eddie McClintock). Romance also blossoms between Jack Hodgins and Angela Montenegro (T.J. Thyne and Michaela Conlin). Even youthful genius Zach Addy (Eric Millegan) does some growing up, earning his first Ph.D. This may seem a lot of change for one season, but most of the change occurs organically. The show’s crime element remains compelling and fast-paced, the tension only heightened as viewers come to care more about the characters. The second season set includes all 21 aired episodes on 6 discs, two audio commentaries, two behind-the-scenes featurettes, deleted scenes, and a gag reel. 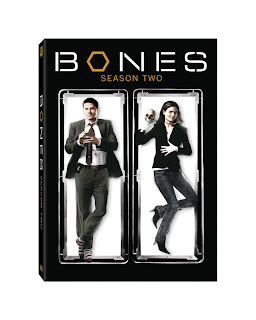 Order Bones: Season Two from Amazon.